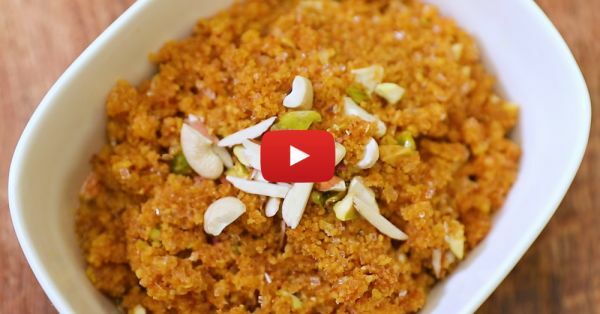 How To Make Yummy Moong Dal Halwa Just Like Your Mom! You’re at home. Sitting on your bed wrapped in a cosy blanket curled up with your favourite book. Your room’s windows are wide open and it is raining outside. Isn’t this the perfect halwa moment? For many more such moments to come this monsoon, here’s a delicious moong dal halwa recipe that’s SO easy and tasty, that it would be the perfect sweet treat for your family! - Strain the soaked dal and coarsely ground it to a paste. - Heat the ghee in a heavy bottomed nonstick pan on low heat. Add the dal paste and cook for 15-20 mins or until it becomes slightly golden brown, stir continuously. - Add the khoya and cook further for 5-10 mins. - Mix in the sugar and cook for another 5 mins. The halwa will gradually change colour. - Lastly, add the cardamom powder and chopped nuts and mix well. Garnish with more chopped nuts and serve hot. You’re now ready for the monsoons! For more, subscribe to POPxo Yum here.